If you’re looking for the most credit card value for your dollar, then credit cards with no annual fees are just what the doctor ordered. These cards offer plenty of the perks you get from credit cards that charge annual fees but without that yearly hit to your bank account. These perks include airline miles, cash back, and introductory 0% APRs, even if your credit score is less than perfect. Another benefit of no-annual-fee credit cards is that it’s easy to keep using them over the long run, as you’ll have no annual fee to raise your blood pressure. That’s important because the credit bureaus look favorably upon a longer average age for your credit accounts and may reward you with a higher credit score. Check out our expert picks for the best no-annual-fee credit cards — one (or more) — might be perfect for you. 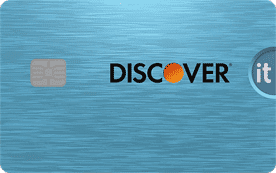 The Discover it® Cash Back card uses a quarterly system of revolving offers that lets you earn 5% cash back at different places throughout the year. All you have to do is activate the card each quarter to rack up cash back (up to the quarterly limit) at places like grocery stores, gas stations, restaurants, Amazon.com, and more. You can use your rewards immediately at Amazon.com checkout. You automatically earn 1% cash back on all other purchases. One coveted feature of the Discover it® Cash Back card is dollar-for-dollar Cashback Match™ on all purchases new cardmembers make during the first year. Your cash back never expires, and you can redeem your rewards whenever you want, in any amount. This card can also save you money on other fees beyond just the annual one. There are no fees for exceeding your credit limit, foreign transactions, or your first late payment. Moreover, your APR won’t go up if your payment is late. When you sign up, Discover will alert you for free if your Social Security number pops up on any of the thousands of risky websites it monitors. Chase calls this card “unlimited” because you earn 1.5% rewards on all purchases, without any annual caps. There is no annual fee, and you can receive a signup bonus. You can get more value from your rewards through monthly discounts on 150 popular gift card brands, and an extra 1% to 15% cash back at more than 350 online retailers via Shop through ChaseⓇ. Cash back doesn’t expire, and there’s no minimum to redeem. The Chase Freedom Unlimited® packs many consumer protection features, including zero liability for unauthorized charges and a one-year extension on eligible U.S. manufacturers’ warranties of three years or less. You also get 120 days of purchase protection against damage or theft up to $50,000 per account and $500 per claim. Add to that auto rental collision damage waiver, trip cancellation/interruption insurance, travel and emergency assistance services, and a free credit score anytime, and you can see this card provides a lot of value for no annual fee. The Wells Fargo Cash Wise Visa® Card should please consumers who want to receive unlimited 1.5% cash rewards on all purchases without quarterly activations or rotating category restrictions. Furthermore, you earn more cash rewards when you use your qualified mobile wallet for purchases during the first 12 months. You can reap bonus rewards and special deals when you use this card to shop on the Wells Fargo Earn More Mall website, and rewards do not expire for the life of the account. You can redeem your cash rewards on the GoFarRewards website, at a Wells Fargo ATM, on your desktop computer or mobile device, at a Wells Fargo branch, through direct deposit to your checking or savings account, or applied against your qualified Wells Fargo mortgage principal balance. Consumer protections include mobile alerts, 24/7 fraud monitoring, and zero liability protection when you promptly report unauthorized transactions. Other benefits include auto rental collision damage waiver, cellphone protection, and emergency cash advances. The Chase Freedom® no-annual-fee card earns you cash back for every purchase. You can earn 5% cash back on up to $1,500 per quarter on combined purchases in bonus categories you activate. All other purchases earn 1% cash back. Cash back rewards don’t expire as long as you keep the account open. There is no minimum redemption amount, and you can redeem your rewards via a statement credit, purchase of gift cards and certificates, or direct deposit into most U.S. savings and checking accounts. Link your card to Amazon.com and use your cash back rewards for eligible orders at checkout. The Chase Freedom® provides several services and protection features, like zero liability protection against unauthorized charges and purchase protection on new purchases against theft or damage for 120 days. Eligible U.S. manufacturers’ warranties of three years or less receive an automatic one-year extension. The card protects you from fraud using real-time transaction monitoring, and Chase will alert you by email, text or phone if it detects unusual activity. One last nifty feature: You can go contactless with the Chase Freedom® card, ensuring secure checkout by simply tapping the card on the checkout terminal. For those with good to excellent credit, the Capital One® VentureOne® Rewards Credit Card offers 1.25 miles on everyday purchases, with no annual limit. Plus, you earn 10X miles on thousands of hotels on Hotels.com when you pay with the card. Miles don’t expire for the life of the account and are easy to redeem. You can also transfer your miles to any of Capital One’s available loyalty programs from airlines such as Air Canada, Air France KLM, and Qantas. The card delivers many other benefits, beginning with no foreign transaction fees, 24-hour travel assistance services, auto rental collision damage waiver, travel accident insurance, and extended warranty protection. You can manage your account on the Capital One mobile app featuring fingerprint sign in, monitor your credit with the CreditWise app, and receive alerts from the Eno® intelligence assistant that also lets you make online purchases using virtual card numbers for added security. Speaking of security, you’re covered by $0 fraud liability and card lock on stolen or lost cards. Is there any reward more versatile than cold hard cash? When you activate the quarterly revolving system from the Discover it® Cash Back, you earn 5% cash back up to the quarterly limit. The revolving categories include restaurants, gas stations, and grocery stores, as well as immediate redemption at Amazon.com checkout. For all other purchases, you earn 1% cash back automatically. Your cash rewards never expire and can be redeemed at any time. 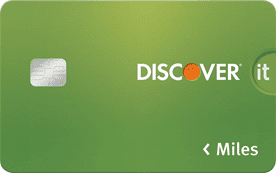 On all purchases during the first year, Discover provides unlimited dollar-for-dollar Cashback Match™. The card is serious about saving you money, with no annual fee and no fees for your first late payment, exceeding your credit limit, or transacting at a foreign location outside of the U.S., and late payments won’t cause your APR to rise. For added peace of mind, Discover monitors your Social Security number should it appear on any of the risky websites it scrutinizes. 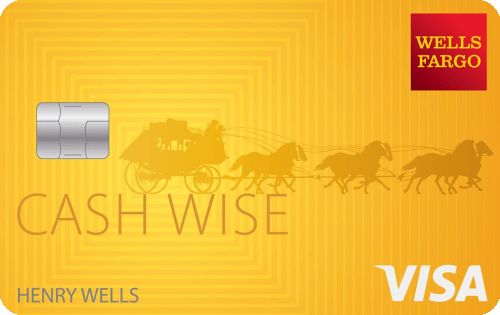 The Wells Fargo Cash Wise Visa® Card welcomes new cardmembers with a cash back bonus when you use the card to make purchases and meet the minimum required spending amount during the initial three months. The card is also a good alternative for those who don’t care for quarterly rotating categories, as it pays you 1.5% cash rewards on all purchases all year long. During the first 12 months, you earn even more cash back on purchases made with your qualified mobile wallet. The card delivers special deals and bonus rewards to online shoppers on the Earn More Mall website. You can easily redeem your rewards at any Wells Fargo branch or ATM, on your mobile device or computer, on the GoFarRewards website, or via direct deposit to your savings or checking account. You can even apply your cash rewards to the principal balance of your qualified Wells Fargo mortgage. When you sign up for the card, you’ll enjoy 0% APR on new purchases and balance transfers for a limited time. After that, your creditworthiness will determine your APR, which will range from 16.24%-28.24% (Variable). Wells Fargo’s got you covered with zero liability protection on promptly reported problems, around the clock fraud monitoring, emergency cash advances, cellphone protection, and collision damage waivers on your rental vehicles. Frequent fliers will appreciate that you won’t suffer the indignity of blackout dates when you redeem your miles on this card. You can fly on any airline, any time. The Discover it® Miles card delivers 1.5x miles for every dollar you spend on purchases, and the miles never expire. During the first year, Discover matches all the miles you earn, automatically. Your miles never expire, even if you close the account, and you can redeem your miles in any amount to credit travel purchases from your statement. Frugal consumers will love that this card has no annual fees and no fees for exceeding your credit limit, paying by phone, making foreign transactions, or for the first time you pay late. You can freeze your account in seconds, and you have $0 fraud liability on unauthorized purchases. Discover will alert you when your Social Security number appears on any suspicious websites and when any new account appears on your credit report. You can access your free credit scorecard to check your FICO Score and related information. The Capital One® VentureOne® Rewards Credit Card is our top travel card in part due to its arrangement with Hotels.com. Cardholders receive 10X miles on thousands of hotels listed on this site when using the Capital One® VentureOne® Rewards Credit Card. In addition, Capital One works directly with airline loyalty programs, including Qantas, Air France KLM, and Air Canada, that will accept your miles. The card delivers 1.25 miles per dollar spent on all other purchases without any annual limits. The Capital One® VentureOne® Rewards Credit Card boasts an intro rate of 0% for 12 months on new purchases and a 14.24% - 24.24% (Variable) APR afterward. Capital One offers several features to make this card more secure and convenient, including credit monitoring via CreditWise, fingerprint security on its mobile app, $0 fraud liability protection, and virtual card generation for online purchases using the Eno® intelligent assistant. Other benefits include collision damage waivers on car rentals, extended warranty protection, and travel accident insurance. The Wells Fargo Propel American Express® Card earns top marks for its rewards, starting with thousands of bonus points when you meet the minimum spending requirement in the first three months. You earn 3x points on specified activities, such as dining out or ordering in, transportation-related expenses, and popular streaming services. All other purchases earn 1x points, and your points don’t expire as long as you keep the account open. You can redeem points for cash back, travel, gift cards, and more. When redeeming for gift cards, your cost for a $25 card is as low as 2,500 points. When redeeming points through the GoFarRewards website, you’ll experience no blackout dates on air travel. Other benefits include 24/7 fraud monitoring, rapid alerts for suspicious or irregular activity, zero liability for unauthorized transactions, cellphone protection, 90-day retail protection, and extended warranty protection. In addition, paying for travel arrangements with the card entitles you to lost luggage reimbursement, car rental loss and damage insurance, roadside assistance, emergency cash advances, and 24/7 travel and emergency assistance. If you are a small business owner, the Ink Business Cash℠ Credit Card will provide you lucrative rewards on business-related purchases. You earn 5% cash back on the first $25,000 spent each account anniversary year for combined purchases on phone, cable, and internet services and at office supply stores. In addition, you earn 2% cash back in each account anniversary year on the first $25,000 spent in combined purchases at restaurants and gas stations. All other purchases earn unlimited 1% cash back. Rewards that never expire as long as the account remains open can be redeemed for cash back, travel, gift cards, and more via Chase Ultimate Rewards®. You can add employee cards to your account at no extra cost. The card entitles you to fraud protection, travel and emergency assistance services, and auto rental collision damage waiver. You also get protection against damage on new purchases for 120 days and for theft up to $50,000 per account and $10,000 per claim. 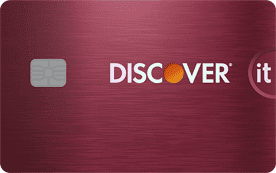 Discover knows that students often have a scant credit history, and have structured the Discover it® Student Cash Back card as the ideal first credit card for your college years. For starters, it pays you a $20 statement credit each school year, for up to five years, when you earn a GPA of at least 3.0. The card pays 5% cash back, up to a quarterly maximum, on different places like restaurants, grocery stores, gas stations, and Amazon.com that rotate every quarter — all you have to do is activate the cash back each quarter. All other purchases earn 1% unlimited cash back. At the end of the first year, Discover automatically matches dollar for dollar all the cash back you earned. The card delivers additional student-friendly benefits, including immediate on/off account switching, unauthorized-use alerts, and free monthly access to your FICO Credit Score, as well as U.S.-based customer service. Capital One has designed the Capital One® Secured Mastercard® to help you rebuild your credit score. Its $0 annual fee helps you take control of your credit when you use the card responsibly. You secure the card with a required, refundable security deposit of $49, $99 or $200, depending upon your creditworthiness. After you make the minimum required deposit, you’ll receive a starting credit line of $200. If you make a larger initial deposit, you can get a higher credit line. You may also be able to increase your credit line by meeting your first five monthly payments by their due dates. New cardmembers will receive a 26.99% (Variable) APR. You can personalize your payments by selecting a monthly due date and payment method — online, check, or at your local branch. Other card benefits include instant purchase notifications on your Capital One Mobile App, email or text account alerts, fraud coverage, card lock, virtual card numbers from ENO®, automatic monthly payments, and 24/7 customer service. You also receive travel accident insurance, extended warranties on purchases, auto rental collision damage waiver, and 24-hour travel assistance services. There are no foreign transaction fees, and you can monitor your credit for free with CreditWise® from Capital One. If your credit score is fair to average, consider the Capital One® Platinum Credit Card. You could receive access to a higher credit limit with five consecutive on-time monthly payments. The regular APR for new cardmembers is 16.24% - 26.24% (Variable), depending upon your creditworthiness and the prime rate. There are no foreign transaction fees and the card comes with impressive features, such as SureSwipe/TouchID for fingerprint or customized pattern sign-in on the Capital One Mobile App. Account management is easy as you receive personalized account alerts, view monthly recurring transactions, autopay your monthly bill, add authorized users, and access 24/7 customer service. You also receive a slew of Capital One card benefits for retail, travel, security, and digital services. Capital One is a reputable global bank that offers its customers a slew of perks and conveniences, so it’s no wonder the convenient Capital One® Platinum Credit Card is our top choice for those with fair credit, limited credit, and no credit history at all. You’ll receive free credit monitoring with CreditWise from Capital One and ENO® acts as your intelligent assistant, answering your questions, sending you alerts, creating virtual card numbers for online purchases, and reporting your account status 24/7. That’s a lot of technology-forward features for no annual fee. The card comes with many other conveniences, like setting up automatic monthly account payments on the due date of your choosing. You’ll receive $0 fraud liability coverage if your card is stolen or lost, and you can instantly lock the card if you misplace it. Security alerts can be delivered via your phone, email, or text message. In travel and retail settings, the card delivers 24-hour travel assistance services, travel accident insurance, auto rental collision damage waiver, and extended warranty protection coverage. There are no foreign transaction fees when you use the card outside of the United States. What Are Pros & Cons of Credit Cards Without Annual Fees? You’d be justified in thinking that, all things being equal, consumers would choose only no-annual-fee credit cards and save some money. The rub is, all things aren’t equal. Cards with annual fees offer more generous rewards and more lavish benefits. Let’s explore the pros and cons of credit cards without annual fees. A good first card: If you are new to credit cards, you may find it difficult to gauge whether you would use an annual-fee card enough to benefit from its more generous rewards. Although cards with annual fees tend to be more lavish, the benefits they bestow may not be enough to overcome the fee, especially if you don’t plan to use the card much. Therefore, it may make sense to start with a solid no-annual-fee card and get your credit sea legs before committing to a card with annual charges. Simple is as simple does: Some of us like to live a simple life, where value and convenience outweigh perks and rewards. Your life may not revolve around travel miles or cash back. You may want a credit card simply because you don’t like paying with cash or checks. If so, the simplicity of a card with no annual fees can be quite appealing. You just hate fees: The idea of paying extra fees to a credit card company makes your skin crawl. Happily, you can see from our list of cards above that you don’t have to sacrifice much to get a first-rate card that gives you many of the same rewards you’ll find on cards with annual fees. Your credit is poor or non-existent: You can build (or rebuild) your credit using a no-annual-fee card without diverting money to pay a fee. From our list, you can see there are several no-annual-fee cards available for the credit-challenged. A good strategy would be to lift your credit score using a no-fee card, and then switching to a fancier card once you prove your creditworthiness. Higher APRs, fewer rewards: Compared to their annual-fee brethren, cards with no annual fees generally provide slimmer rewards. You won’t find any no-fee cards with a 50,000-mile signup bonus, something you can get from a card with an annual fee. No-annual-fee cards tend to have higher APRs and lower credit limits, although exceptions exist. Waived fees: Many credit cards waive their annual fees for the first year before imposing them on the first anniversary of the account opening. That means you can get an annual-fee card and all its benefits without shelling out the fee in the first year. This gives you a chance to decide whether to pay the fee on your first anniversary or switch to a no-fee card. Is It Worth Getting a Credit Card With an Annual Fee? Big spenders get big rewards: You may find the annual fee small change compared to the generous and unlimited rewards available from many annual-fee credit cards. Those rewards will probably pay for fees with plenty to spare. You can select a credit card that matches your spending patterns, such as ones offering travel miles or hotel discounts. Robust sign-up bonuses: The sign-up bonuses are almost always better on credit cards with annual fees. We see sign-up bonuses on these cards of 50,000 miles or sign-up bonuses on these cards of 50,000 miles or more and cash back bonuses of up to $500. Naturally, the first-three-month spending requirements to qualify for the sign-up bonus from these cards are also higher. Expensive cards offer more perks: If you have the need for a personal concierge, automatic upgrades to flights and hotels, and discounts on cruises or luxury car rentals, you may be tempted to plunk down a three- or four-figure annual fee to obtain a premium credit card. Some of these cards are so exclusive that you can only get them by invitation. If you don’t settle for anything but the best, these cards are for you. Prestige! : Let’s just stipulate that certain people on this planet like to impress the rest of us with their wealth, power, and prestige. What better way to subtly hammer that home than with a credit card that charges a hefty annual fee. Hey, whatever floats your boat. With a no-annual-fee credit card, all your payments go toward reducing your balance. As we’ve seen, many of these cards offer good benefits and easy access, even if your credit is poor or non-existent. There are cards geared toward travelers, students, businesses or just ordinary consumers. For many people, credit cards with no annual fee are a perfect combination of low cost and high value, as our list of the top 15 cards vividly reveals.